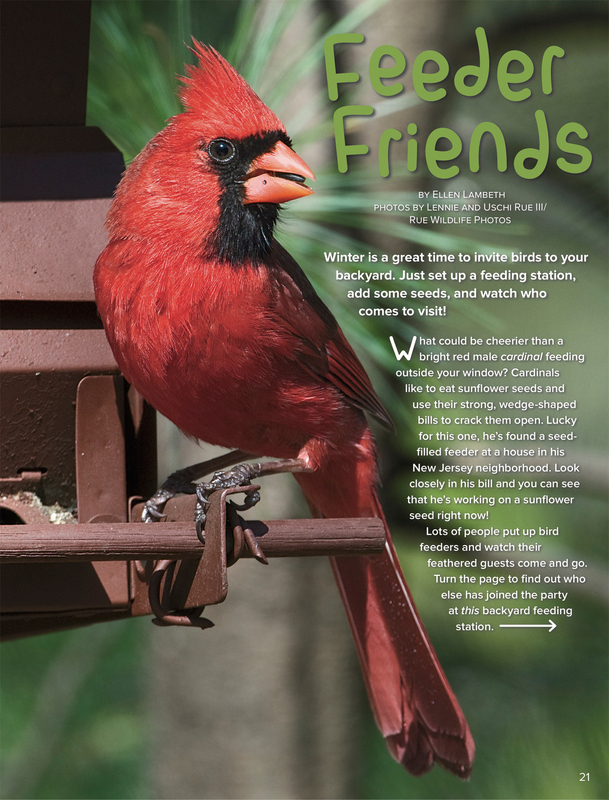 Winter is a great time to invite birds to your backyard. Just set up a feeding station, add some seeds, and watch who comes to visit! What could be cheerier than a bright red male cardinal feeding outside your window? Cardinals like to eat sunflower seeds and use their strong, wedge-shaped bills to crack them open. Lucky for this one, he’s found a seed-filled feeder at a house in his New Jersey neighborhood. Look closely in his bill and you can see that he’s working on a sunflower seed right now! Lots of people put up bird feeders and watch their feathered guests come and go. Keep reading to find out who else has joined the party at this backyard feeding station. Cardinals like feeders they can perch on. But they will visit platform feeders, too. Ground-feeding birds such as sparrows and juncos prefer this kind of feeder. Sometimes a feeding station attracts birds that are interested in other birds—not seeds. The young Cooper’s hawk above, for example, is on the hunt for a feathered snack. Sure, ducks are birds, too. But you don’t often find them at feeders! Tell that to the wood duck above. She found the perfect spot to rest and fill up. Wait—who invited YOU? Most people who feed backyard birds know about uninvited feeder guests. The watchful one above is a red squirrel. Depending on where you live, you may be more likely to see a gray squirrel or a fox squirrel raiding your feeders. And if you check in after dark, you might even catch a flying squirrel in the act. Sometimes it’s fun to watch squirrels at a feeder. More often, it’s just annoying because they quickly take more than their fair share. Some people try to outsmart the greedy seed thieves. But it’s hard to fool a hungry squirrel—even with a “squirrel-proof” feeder! And some uninvited guests are more than just pests. 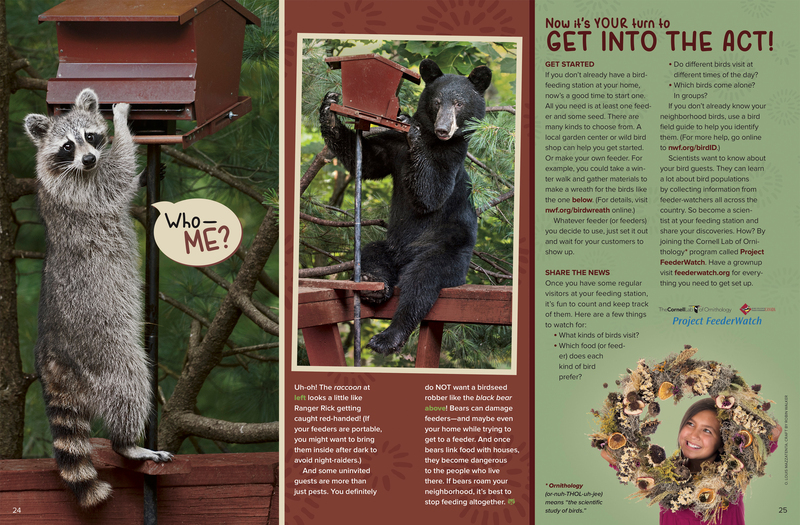 You definitely do NOT want a birdseed robber like the black bear above! Bears can damage feeders—and maybe even your home while trying to get to a feeder. And once bears link food with houses, they become dangerous to the people who live there. If bears roam your neighborhood, it’s best to stop feeding altogether. NOW IT’S YOUR TURN TO GET INTO THE ACT! If you don’t already have a birdfeeding station at your home, now’s a good time to start one. All you need is at least one feeder and some seed. There are many kinds to choose from. A local garden center or wild bird shop can help you get started. Or make your own feeder. For example, you could take a winter walk and gather materials to make a wreath for the birds like the one above. Whatever feeder (or feeders) you decide to use, just set it out and wait for your customers to show up. • What kinds of birds visit? 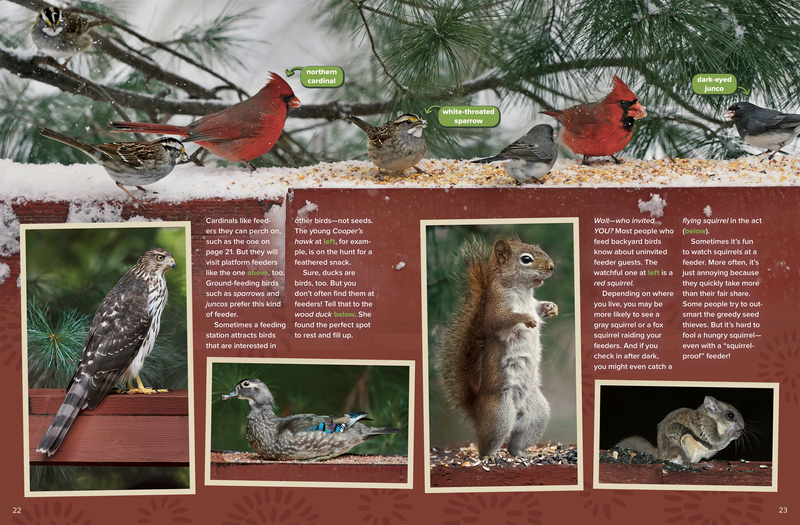 • Which food (or feeder) does each kind of bird prefer? • Do different birds visit at different times of the day? • Which birds come alone? In groups? Scientists want to know about your bird guests. They can learn a lot about bird populations by collecting information from feeder-watchers all across the country. So become a scientist at your feeding station and share your discoveries. How? By joining the Cornell Lab of Ornithology* program called Project FeederWatch. Have a grownup visit feederwatch.org for everything you need to get set up. “Feeder Friends” originally appeared in the December/January 2018 issue of Ranger Rick magazine.